Adding 1/4 of the sweet potato peels to the soup intensifies the natural sweet potato flavor, a tip I picked up from the research team over at Cooks Illustrated. Water is used instead of broth. 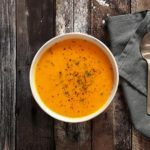 If you’re scoffing at this and already plan to substitute broth (like I always find myself doing), resist! Really, this is the one time where water is the winner because it doesn’t muddy that pure sweet potato flavor we are after. (I’ve tried other soups with water and always prefer broth… this is the only exception I’ve ever allowed). Speaking of water, another key part of this recipe is to reduce diluting the soup with extra liquid. Normally a soup with starchy potatoes requires a lot of liquid to thin it out. But thanks again to the research team at Cooks Illustrated, they found that when you let the potatoes sit in hot water (off the burner) for 20 minutes before boiling them, the starch molecules form differently. This step creates a creamy, thinned soup. Whereas the typical method of adding potatoes to boiling water and holding them at a simmer, creates a loose mash with the same amount of water (thus requiring even more water to thin it into a soup and diluting the flavor). A soup that highlights the sweet potato flavor. Sweet potatoes: Peel the potatoes and reserve 1/4 of the skins (those will go in the soup). Cut sweet potatoes in half, then slice into 1/4 inch half-rounds. Melt butter in your favorite soup pan. Add shallots and thyme. Cook for about 5 minutes, until soft. Then add the water and bring to a simmer. Remove the pan from the heat. Add sweet potatoes and reserved peels to the pan. Let stand, uncovered, for 20 minutes. This cooks the sweet potatoes without making them overly starchy. Put the pot back on the stove and add the brown sugar, vinegar, 1.5 tsp salt and 1/2 tsp pepper. Bring to a simmer, then reduce the heat to low, cover, and cook until potatoes are very soft. This will take about 10 minutes. Remove the thyme sprigs. Then puree the soup with an immersion blender, or user a regular blender for an ultra-smooth soup. Add more liquid if needed. Season with salt and pepper if needed. Top with chives (or any other topping), if you are so inclined. Calories, grams of sugar, or total carbohydrates don’t tell the whole story. And none of them are perfect measurements. However, I think they are important because they give you a relative value. That means you can compare a recipe like this to a loaded baked potato soup and see that it has half the calories. Sugar: while sugar is a bit high in this recipe, the added sugar is very low, only 3g from the brown sugar. The majority comes from the sweet potatoes. The amount of added sugar should be limited to 25-30g a day (according to the American Heart Association). Vitamin A: Thanks to the sweet potatoes, this recipe has over 100% of your daily value of vitamin A. It is fat-soluble, so don’t skip the butter in this recipe! I am a big fan of Cooks Illustrated which really digs into the science of recipes to find the perfect balance of flavor and effort. Their recipes never let me down. You can also check out Milk Street, which is a new magazine (and website) started by the previous founder of Cooks Illustrated. (I do not get paid for those links. I am sharing them because they are some of my favorite sources of recipes).